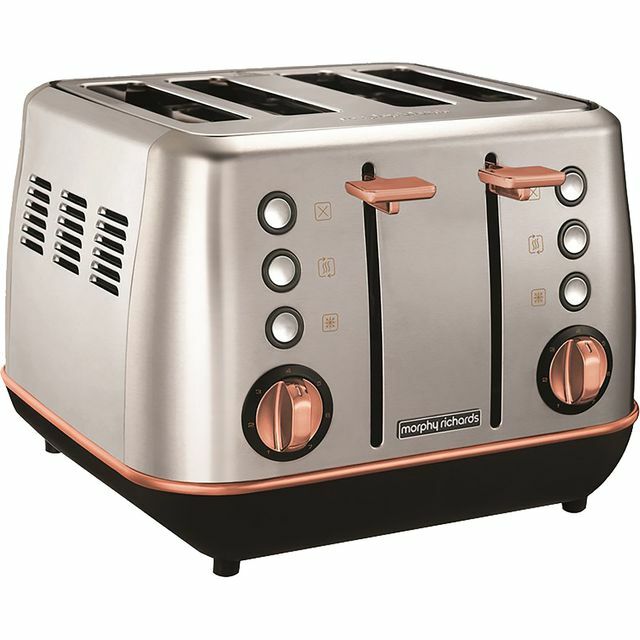 Whether you prefer wholemeal, white or granary, this brushed rose gold Morphy Richards 4 slice toaster makes delicious breakfasts effortlessly. Thanks to the variable browning feature, you can always choose the ideal setting that’ll make your toast exactly as you like it – from lightly golden to more well-done. If it pops up while you’re making the packed lunches, the reheat function will warm up your slices again when you’re ready to eat, without browning them any further. It has a defrost function as well, so you can toast those frozen teacakes straightaway. And, with a handy removable crumb tray, you’ll find it really easy to clean.